In Malaysia, we are blessed for we are given free dental services in the primary and secondary schools nationwide by the Malaysian Dental Association (MDA). Due to the expensive charges from private dentists, and the long waiting line in government dental clinics, many parents are very reluctant to bring their children to see the dentist. Some of parents could not even afford it. Most of the parents have the concept that, milk teeth (the baby’s first set of teeth) are going to fall out sooner or later, so they are not important at all. This is not true, as poorly taken care of milk teeth will lead to many problems in the future, and in some circumstances, will negatively affect the permanent teeth. The very first step to ensure healthy teeth for the baby is by ensuring the mother has a good diet while she is pregnant. Sweet, sticky foods should not be taken frequently, and the mouth’s cleanliness should be paid attention to. Due to the hormone changes in the pregnant mother’s body, it is common for them to have swollen, bleeding gums. Hence, increasing the importance of having a good diet and maintaining a clean mouth. It has been proven that if a pregnant mother has a lot of decayed teeth, the bacteria causing the tooth decay can be spread to the baby, and increasing the chances of the baby having decay teeth throughout the lifetime. How to get the child to go to the dentist? To get the child to be more cooperative while visiting the dentist, parents can try to prepare the child mentally. This is very important, as the first visit to the dentist gives a huge impact to the child. Many grown adults are afraid of the dentist because they had a bad experience. If the child has a bad first visit, it would probably make the child afraid of the dentist for the rest of the child’s life. There are some story books that are dentist-friendly, such as “Show me your smile” from the popular Dora the explorer cartoon character, “Calliou at the Dentist” by Johanne Mercer, “My Dentist My Friend” by P.K. Hallinan and “Just Going to the Dentist” by Mercer Mayer. By showing the child that the dentist is just another regular person doing their jobs, it will decrease the child’s fear. Parents can also bring their child along whenever they attend a dental checkup. By seeing their parents being treated by the dentist, and no harm befalling them, the child is less likely to resist when it’s their turn to go visit the dentist. The child can be cuddled in the dental chair, if they are still young, or sit nearby and observe what is happening. Dentist often use this opportunity to tell the child what is procedure, and show the child how it is done. This technique is also known as Tell- show- do. However, if the procedure is a complicated one, it is better to leave the child at home. When to see the dentist earlier? If no tooth has erupted by the 10th month, it is better if the child is brought to see a dentist that specializes in children, also known as pedodontist. Also, if you notice that your child has a lot of decayed teeth, you should start taking note of how your child brushes their teeth, and how often do they do it. Diet also plays an important role in tooth decay, so home care also plays a big role, and the parents should not only rely on the dentist to take care of their children’s teeth. 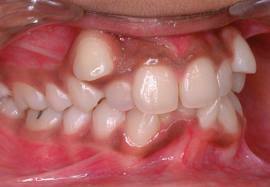 Another main reason for early dental visits is crooked teeth. However, if the child attends dental visits regularly, which is twice a year, the dentist will spot this problem earlier on, and take appropriate means to correct it. 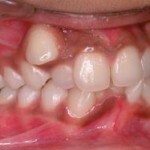 Therefore, it is really important for the child to see the dentist regularly. It is normal for the child to cry and struggle if they refuse dental treatment, however, a good pedodontist will be patient, and not force the child into treatment. It is important for the parent to feel comfortable with the dentist and trust the dentist, if not, the child will also sense the parent’s anxiety, and refuse to cooperate even more. It is the combined effort of the parents, the dentist, and the child’s, that the child can maintain a set of healthy, shiny teeth. This entry was posted in Baby Teeth, Oral Care and tagged child, cooperative, decayed teeth, dentist friendly books, good diet, home care, milk teeth, milk water ratio, observe, tell show do on September 17, 2010 by chzechze.